Stepping into the Frame in the South of France | Passing Through . . . . It was Paul Cézanne who went to L’Estaque first, in 1864. 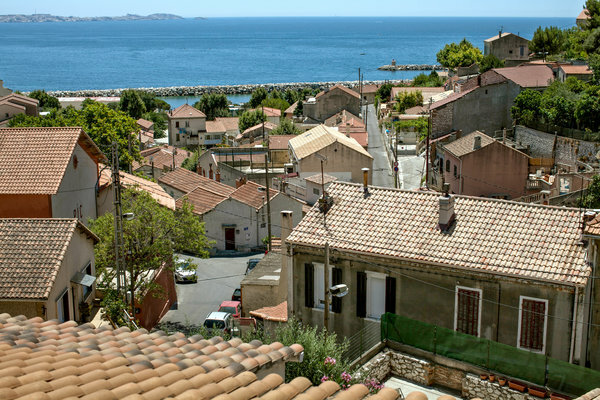 He escaped the gray dreariness of Paris and later avoided army conscription in the Franco-Prussian War of 1870 in this sunny shorefront village outside Marseille. From the windows of a rented house next to the little church on the hill, he could look out on the tile rooftops leading down to the harbor, with its fishing boats, and across the wide bay to Marseille, the low, rocky mountains at its back. In 1906, Georges Braque went to L’Estaque after seeing Cézanne’s work on view in Paris. He stayed five months. “It was in the South that I felt my rapture rise in me,” wrote Braque, who grew up in Le Havre, on the English Channel. That same fall, Cézanne died. One century was giving way to the next. Braque had reshuffled the playing cards, making the familiar landscape even more unfamiliar. With his brush, the boxy roofs became puzzle pieces, the arches of the local viaduct a study in the contrast between positive and negative space. By 1908, he had flattened the windswept trees to the boundary between the second and third dimensions. Impressionism changed to Fauvism in Braque’s hallucinatory forests, where solitary walkers lose themselves in oneiric expanses of yellow and purple — and then to Cubism. I wanted to see it for myself, this landscape of L’Estaque that I had known from so many paintings over the years, and that I had rediscovered in the Musée d’Orsay and the Pompidou Center since moving to Paris last year. 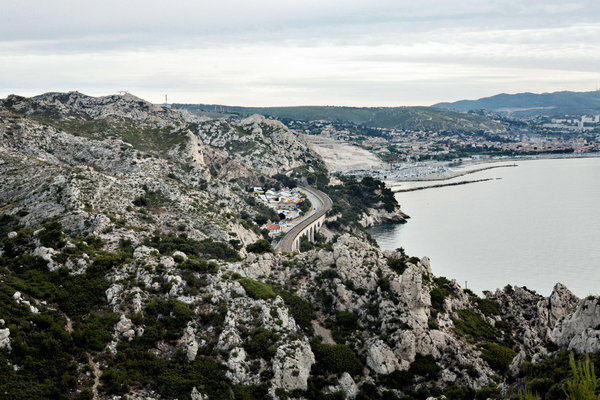 And so, one weekend this spring, I took a train to Marseille to look around. The sun was bright, but I was in a ruminative mood. My own picture plane was starting to shift. I wanted new vistas. I wanted, I think, to step into a painting. But scenes change over time. While van Gogh’s Arles maintains much of its postcard perfection, and Monet’s gardens at Giverny theirs, L’Estaque, in spite of its significance in art history, is perhaps the least touristic and least romanticized of the locales that so inspired the great French painters. Today, L’Estaque is not the sleepy fishing village that Cézanne and Braque found more than a century ago. It is part of the 16th Arrondissement of vivacious Marseille, a working-class area absorbed into the busy larger city, with a pretty harbor, one main street lined with shops and cafes, and a dearth of parking. I was glad to be there anyway. After all, what is travel — or life, for that matter — but a continuing negotiation between expectation and reality? A friend and I arrived at midday on a lazy Saturday. In the cafes by the harbor, people drank coffee or stirred glasses of cloudy yellow Pernod. There were market stalls with cheap socks, housewares and towels, and a flea market where women in abayas browsed for bargains. We settled into a waterfront restaurant and ate fish and got drowsy on dry rosé, watching boats bobbing in their moorings. Off a nearby dock, young boys, tanned and fearless, somersaulted off the rocks into the water, like so many of their kin around the Mediterranean, over so many centuries. Up the hillside on the edge of town, the landscape opens up to a wide view of the harbor. You can see a small island, and the hills east of Marseille, bluish in the distance, just as they appear in so many of Cézanne’s landscapes, “Gulf of Marseille Seen From L’Estaque,” which are now scattered in museums around the world. On a lookout point near the Fondation Monticelli, which celebrates Adolphe Monticelli, a lesser-known Marseille painter who died in 1886, a group of young men were drinking beer and having a makeshift barbecue. Their car radios played Arabic-inflected hip-hop. On the beach below, people were sunning themselves on the rocks. When Cézanne was here, there were no doubt 19th-century locals also picnicking nearby. But the artist willfully left out the quotidian, the bustling harbor, instead shaping the landscape to his own imaginative needs. “I have a lot of good points of view, but that doesn’t exactly add up to a theme,” Cézanne wrote of L’Estaque to his friend Émile Zola in a letter. It was Cézanne’s mother who had first taken a house in L’Estaque in the summer of 1864, when the painter was 25. Later, in 1870, he hid out here to avoid army conscription, and also to hide the existence of his partner, Marie-Hortense Fiquet, from his father, who disapproved. One wonders how the course of art history might have turned out had Cézanne’s mother chosen a house in a different town. In 1882, Pierre-Auguste Renoir came to visit Cézanne, and the two painted together. Renoir’s “Rocky Crags at L’Estaque” of that year shows the hillside and vegetation in his characteristically fuzzy style. Cézanne always stayed more angular, more intense. He painted like a man working out a mathematical problem. Each brush stroke, each painting, reveals how he reached his conclusions. Every painter had a different perspective. In 1908, Raoul Dufy arrived to paint with his friend Braque, after seeing Braque’s L’Estaque works displayed in Paris. The Fauvist André Derain painted colorful, happy harbor scenes that make Cézanne’s look melancholy in comparison. 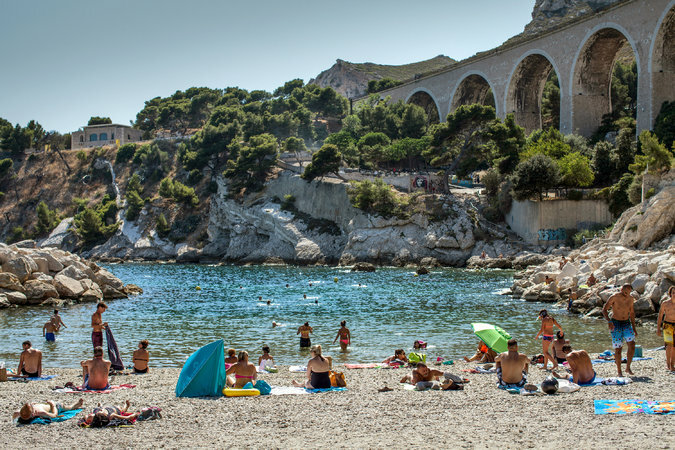 The best way to visit L’Estaque is as an afternoon or twilight jaunt, by boat, from Marseille, that great Mediterranean port city — Naples meets Barcelona — famous for its blinding light, its bouillabaisse, its couscous, its close ties to the Maghreb, and, alas, its often violent organized crime. Ferries to L’Estaque leave every hour from Marseille’s Old Port, a deep harbor that has been in continuous use since the days of the ancient Greeks. 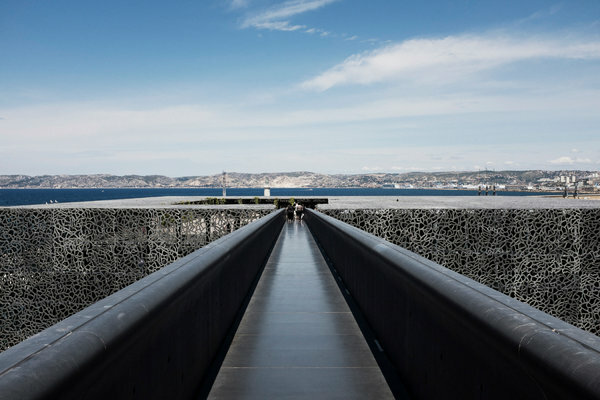 The boat pulls out of the harbor and rounds the bend by the MuCEM — the Museum of European and Mediterranean Civilizations — a spectacular new space designed by Rudy Ricciotti, an architect based in nearby Bandol. Today, some of the best views of L’Estaque are from the roof of the MuCEM. With its dark cement latticework facade meant to evoke a casbah, the MuCEM is also a study in positive and negative space. (Mr. Ricciotti has said that in Marseille, the light is one of the strongest architectural elements.) From the top of an adjacent fortress, the MuCEM’s roof stretches just below the line where the ocean meets the shore. In the foreground, a sparkling new tower by the architect Zaha Hadid swoops up into the air, reflecting the light and straddling the highway running west toward L’Estaque. Along that road, a billboard for Panzani Zakia halal lasagna fills the entire side of a tall building. Huge ferries bound for Tunisia and Algeria sit in the harbor. Kiosks on L’Estaque’s main street sell local specialties: chichi frégi, fried dough with a hint of crushed black pepper inside and coated in coarse sugar, and panisses, chickpea flour fritters. We bought a snack and a cold bottle of La Cagole, a Marseille beer, and strolled up the quiet back streets. They were empty of people, except for a few other tourists hoping to walk in the footsteps of the great artists, and looking a bit disappointed. There were posters for the coming European parliamentary elections, for the Greens and the right-wing National Front, which would later triumph. We sat in the square by the church, by Cézanne’s house, now marked by a small, unassuming plaque, and watched the sun set, turning the mountains behind Marseille a reddish pink. Some new buildings blocked the view of the harbor. Cranes rose high in the industrial port and the hulks of vast cruise ships lingered in the blue waters. For years, Cézanne had ignored the parts of L’Estaque that he didn’t want to paint. By 1885, he stopped coming. The landscape was changing too much for his taste, becoming too industrialized, with factories and chimneys cropping up along the shore. Economic development and artistic development subtly intertwined. Braque saw the factories, with their smokestacks spewing sodium and sulfuric acid, as source of inspiration. In 1910, he painted “Rio Tinto Factories at L’Estaque,” a Cubist study in grays and browns that is now in the collection of the Pompidou Center. Cézanne moved elsewhere, to find new vistas. I remember that one spring, in my early 20s, I took the TGV from Avignon to Nice. Out the window, fields of lavender blurred by. And then, in the distance, there it was: Mont Ste.-Victoire. I already knew it by heart, the mountain Cézanne had painted so many times — a study in form, an exercise of style, a realm of the imagination. Not just a mountain, but the idea of a mountain. It was even more familiar out the windows of the fast train, the perspective ever changing. “Magnificent in the distance, meaningless closer up, mountains are but a surface standing on end,” Joseph Brodsky wrote in “An Admonition,” one of my favorite poems. Like Petrarch in the 14th century, who opened the door to the Renaissance and to new ways of thinking when he climbed Mont Ventoux simply to take in the view, Cézanne, by power of his vision, also changed forever the way we think and see. At a monumental retrospective of paintings by Georges Braque at the Grand Palais in Paris that I saw last year, I found myself unexpectedly moved by some of the artist’s late paintings, tiny landscapes from the mid-1950s, when he was in his 70s. His career had traced almost every new development in art for half a century, and then, nearing the end of his life, he returned to the beginning, to landscapes with rough brush strokes, more like van Gogh than Picasso. They seemed not just landscapes, but memories of landscapes. In the end, the L’Estaque of the artists may outshine the L’Estaque of life. But the place still lingers in my mind. I revisit the paintings in the museums. I think back to the weekend — to the sun, to the crusted sugar on the fried dough, to the ferries headed for the Maghreb, to the rocky coastline. The boat glides across the harbor toward the village. Marseille is at our back, the limestone hills approaching in the distance. There is a cool breeze. The ocean opens up before us. It is filled with possibility — and with the memory of possibility. Rachel Donadio is a culture correspondent for The New York Times, based in Paris.